I live on Cape Cod, one of the birthplaces of American residential architecture. A place where the oldest homes aren’t called, simply, “really old,” they’re called “antique.” Even if you’ve lived in one of these structures for decades, raised a family there and poured small fortunes into upkeep and repair, others in town will likely refer to your residence by the name of the sea captain (or smuggler) who built the original structure, perhaps some 200 years ago. Driving Route 6A, the road that runs past my front door, is like taking a Disneyworld ride through American residential-architecture history. Instead of animatronic presidents, 6A presents salt boxes, classic capes in their half, three-quarter and full versions, Georgian and Federal style manses and Greek revival farm homes. Many of these long-lived wonders have been restored to their original appearance with textbook accuracy. You can stop at just about any point along this winding road and find a house with historic past worthy of conversation. Unless, of course, you stop in front of my house. Now, if you’re working on some kind of obscure doctoral thesis on classic 1960s Cape design, you might find a wealth of worthwhile information within my four walls. The use of knotty pine in just about any vertical application, say, or the evolution of speckles in vinyl tile flooring – 1965 through 1967. Otherwise, the 1,300-sq.-ft. structure that I call home is just another shingled Cape. It would fit comfortably in many aging suburban developments throughout the Northeast, but, instead, it’s been plopped down in the middle of the country’s longest continuous registered historic district. It’s simply new-old in a land of old-old. After just a couple months of living in it, though, I find I’m falling in love with this undistinguished – and indistinguishable – house, despite its lack of pedigree. Life within its un-historic confines is proving to be surprisingly freeing. My neighbors have windows made from 200-year-old hand-blown glass and chimneys wide as redwoods, but I feel no sense of envy toward these historically significant Joneses. I drive past centuries of style with every supermarket run, and return to my 1960s Cape on its concrete-block foundation, knowing that if a pipe bursts or an electrical outlet shorts out, I won’t need an architectural-history degree to make things right again. My last two homes in Chicago each had their own unique historical aspects, each an example of a classic style unique to that city’s storied design past. My spacious condo in a circa 1904, six-unit apartment building, had a gracious, airy floor plan made for entertaining, with a split-parlor living room, beamed-ceilinged dining room and original windows throughout. My most recent home, in the city’s famed Bungalow Belt, was one of about 80,000 brick houses built between the early 1910s and the late 1920s, in a collar around the city’s outer borders. It had two layers of crown molding, 9-ft. ceilings and built-in, glass-door-fronted bookcases on either side of the ornamental fireplace. Both of these places had acres of full-grained oak trim, still with the original finish. Have you ever tried decorating with that much oak? There are, perhaps, three colors that go well with it, and I used variations of these dark, earthy, depressing hues over and over and over again. I could have simply painted the trim white to accompany a brighter palette, but covering original trim in Chicago is a violation akin to doubting the Cubs will, in fact, go all the way next year. And 100-year-old windows are only beautiful until you have to live with them through a Chicago winter. I could have parasailed down the hallway in my old condo, with the wind that passed through the ill-fitting sashes. I went into each of these purchases understanding the possible shortcomings, but I had lived in older structures my entire life, and couldn’t imagine calling new construction, “home.” I saw these properties as valuable, yet ignored, resources in a time when society’s quest for newness was forcing our consumption of ever-larger portions of the world’s limited resources. Just as importantly, I think I felt a need to surround myself with history others had created, as I worked out what, exactly, my own legacy might be. So I stripped wallpaper, pulled out rotting sculptured-pile carpet and sought out period-looking plumbing. I collected a forest-worth of paint chips and spent hours simply sitting on the floor, staring at the samples I’d taped to the walls. In time, as I got to know the history-rich quirks that defined these two residences, they each became a home I lived in, loved and, eventually, left. Moving from my Chicago bungalow to the Cape brings me something close to full circle in my own personal history. In addition to simply being a beautiful place to live, this sandy spit also is home to some very fond memories of summers spent with my grandparents. They bought their little 2-bedroom, 1-bath Cape-style ranch in 1968 – one of the few brand-new houses anyone in my family has ever owned. The eight summers I spent with them there were spirit-saving respites from a life lived in the shadows of my parents’ unhappy marriage. In coming back to Cape Cod, I am, in a way, using this place of personal history as a jumping-off point to a new beginning. Chicago became my home mostly because it wasn’t St. Louis, where my parents lived. It remained my home because the friendships I made there made it easier to simply stay put. With my conscious decision to move to this new house, I feel I’ve been given the chance to rewind the tape of my life and push “start” again, from a point of happiness and connection – a unique opportunity for anyone. My new Route 6A roost is just a few years older than my grandparents’ little home, and sits just a few miles away. The neighborhood here, though, is markedly upscale in comparison. My grandparents lived in a middle-class, suburban-style development filled with houses that looked just like theirs and all built within a few years of each other – a Levittown by the sea, if you will. The two-lane highway I now call home, on the other hand, began life as a Native American trail and now serves as the picture-postcard image of Olde Cape Cod, and local historic commissions make sure it stays that way. As a result, I still have to contend with history in my 1965 Cape – changing the color of my front door, for example, could require an appearance in front of the historic commission, to argue my case for, perhaps, “autumn harvest” red over the current forest green. But within my new home’s walls, I work with a clean slate. And this little house that needs work just about everywhere I turn is giving me a chance to revel in its potential. Windows leak like sieves? Get new airtight double-panes! Think the fireplace mantle is just too wimpy? Chuck it! 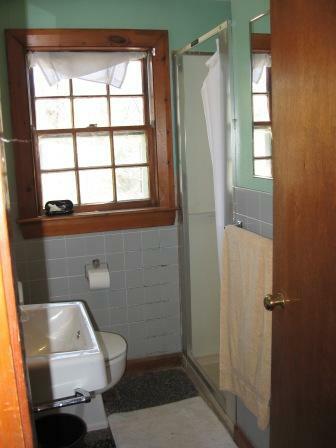 And what about that cheap, varnished-pine clamshell molding surrounding every door and window? I’m now buying Benjamin Moore Decorator’s White by the contractor-size bucket to cover it all up. After years of having to consider architectural significance, I now have the chance to create my own, instead. It seems that, in this land of 300-year-old salt boxes, I have found new possibilities, and a home that belongs, not to history, but to me, alone. As I’ve been learning since my move to the Cape two months ago, this region has its share of issues. The term “affordable housing” is an oxymoron here, rabies has invaded from the mainland and a tiny little creature may be munching its way through our salt marshes. In addition, scientists have recently discovered that the hot air released in the increasingly vociferous wind-farm debates is, itself, a greenhouse gas, which is now threatening to advance global-warming problems at a highly accelerated pace. So, to help myself get back in touch with why I actually moved here, I took an afternoon’s sabbatical during yesterday’s idyllic sunshine, dragged my bike out of the garage, filled up the tires and headed out on the Cape Cod Rail Trail. I’ve got to say, despite all the travails facing this extended spit, when the Cape gets something right, it really gets it right. I wandered through woods and alongside a salt marsh, riding as easily as if on a (occasionally potholed) city street. What an amazing resource – and I only made it as far as Orleans Center. 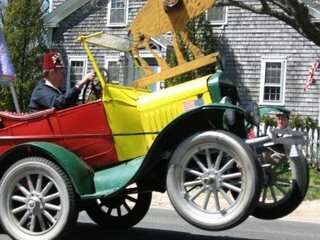 I’m already looking forward to a trek out to Wellfleet. So the next time the Cape Cod Times headlines have you imagining wind-turbine blades as politician-whacking samurai swords, and rabies fears have you locking your animals into air-tight containers for the night, head for a bike trail or beach or still-existent salt marsh. Walk through a wooded grove or spot some birds worth spotting. The problems here on the Cape aren’t all that different from the issues facing others throughout the state, across the country and around the globe. But the places we have to get away from those problems are truly unique. 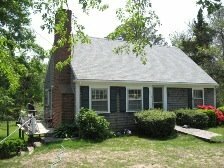 Last fall, as I began my hunt for a house I could actually afford on Cape Cod, I had a little fantasy of stumbling across some down-on-its-luck, shingled matron of a home, on a bluff overlooking the bay. Of course, once I started getting serious, that fantasy was put away – even the poorest excuse for shelter in such a location was three times more than I’ll likely earn in my lifetime. Beyond that, taxes and insurance would have been astronomical, and then there was the danger that the whole bloody thing could be swept out to sea in a storm. So now I live along the historic Old Kings Highway, about a mile’s walk to a nearby town landing. A lovely setting, but water views are not part of my everyday life. This changed, however, for an all-too-brief period during this past weekend’s epic rainy spell, when I was able to live my dream of waterfront living. Arriving home Sunday night from a quick weekend jaunt to visit friends in Chicago, I pulled into my driveway to find that the mighty Considine (the drainage ditch that cuts midway through my lot) had overflowed its banks and filled much of my backyard with up to six inches of water. My pair of faux adirondack chairs were sitting on a barely-above-sea-level island, as a bed of nearby irises waved its leaves like marsh grass above high tide. There I sat, boat shoes on the deck railing, martini glass in hand. Wasn’t that a sail boat on the horizon? Did I just see a dolphin break through the waves? And is that some trespassing nincompoop walking his poop-producing dog across my private beach?! I may not have had the plaid pants, but I was beginning to get the attitude down. But, by early this morning, the waters had receded, leaving a couple small ponds behind (sorta like what the glaciers did when they pulled back). Soon, these, too, will have evaporated or percolated down into the sandy soil, and I’ll be back to living almost a mile from any notable water body. For a few short hours, though, waterfront living was mine, and now I know my tide might return with the next torrential rainfall. Please don’t tell the assessor, though – he might just have to raise my taxes. 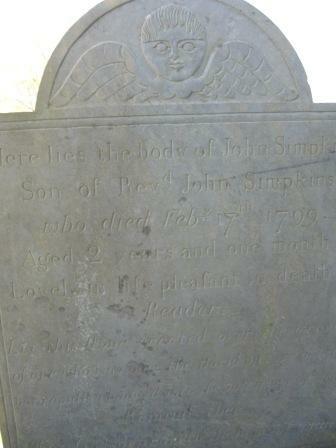 Cemeteries have always fascinated me, as far back as I can remember, the older, the better. There were at least two very old cemeteries in Duxbury, the small town about 30 miles south of Boston where I spent first, second and part of third grade. One of them, where my mother also is buried, is the final resting spot of Myles Standish. Stepping into one of these old, old grave yards is like stepping out of time for me, especially when it is filled with the ancient and worn slate stones, with their archaic script and fire-and-brimstone imagery. One of my favorite places in Chicago has long been Graceland Cemetery (opened about 100 years before Elvis moved into his Memphis mansion). This grave yard is more like a well-groomed public sculpture park than a gloomy slasher-movie setting. It’s surrounded by several very busy streets and an elevated train track, but step through its wrought-iron gates and you might feel yourself transported into the gardens of some wealthy steel magnate. This is all the more appropriate since some of Chicago’s wealthiest former residents now call this address home. The grandest memorial, set waterside along the banks of a small manmade pond, is the open Greek Temple built for Potter Palmer, founder of the Palmer House Hotel, and his beloved wife Bertha (her family, the Honores now rest right across the small street fronting the Palmer temple). Wander the narrow paved roads of Graceland, and you’ll also come across memorials for many of Chicago’s most important architects, including Ludwig Mies van der Rohe, Daniel Burnham, John Root and Louis Sullivan – whose Getty tomb, also in Graceland, is considered one of the pre-eminent examples of the first Chicago School of Architecture’s design principles. Of course, Cape Cod is filled with any number of smaller, old-fashioned graveyards (the prefered term, instead of “cemetery,” here, I’ve been told). Some like the amazing Old Burial Ground, in back of the First Parish Unitarian Church in Brewster, are in the center of town or behind prominent churches. Others, like the Pine Grove cemetery, set in the woods off a community of mostly summer residences, are scattered and isolated, set up on hills or nearly forgotten in wooded groves. These remind me of the old grave yard in Thornton Wilder’s fictional Grover’s Corners, where once-active members of a tightly knit community now lie forgotten. 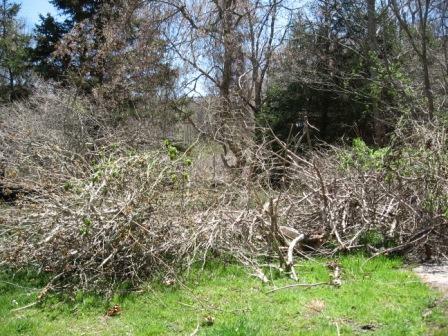 So, while engaged in the seemingly endless task of cutting away the years-worth of bittersweet and green briar vines choking my high-bush blueberries, I began thinking of the perhaps-apocryphal quote attributed to Michelangelo communicating his belief that his sculptures were always present in the stone – his job was just to carve away the marble that surrounded them. The vine-swallowed blueberry bushes present an obvious equivalent, but the more I thought about it, the more Michelangelo’s belief also seemed to describe my feelings about this house and the life I hope to make for myself here: I can almost make out a vision of what I want it all to be, now my job is to carve it out of what is now standing. On a less ethereal note, the contractor says he’ll be able to start May 15 if all the fixtures have arrived. 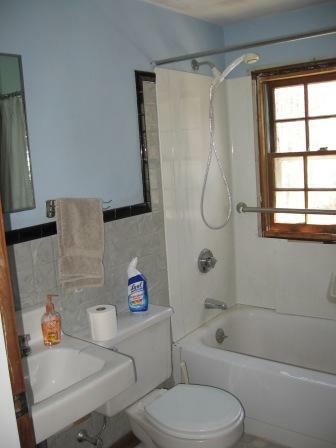 And my faithful realtor has assured me that sinking $30,000 into this place isn’t an example of good money following bad, so I’m going The downstairs bath (left) is tiled in a lovely plastic marbleized product – note the rotting wood window in the tub area. Thinking this all through last night was pretty stressful – I got kind of cranky with Mike the Contractor yesterday afternoon when he came back with final numbers that were $2,000 above previous plumbing estimates, based on higher copper-pipe prices and fixture choices I had made. Upstairs, you may think that’s tile, but it’s actually fiberboard patterned to look like tile and nailed to the wall. And that’s no fancy valance above the window – that’s a towel shoved above the upper sash, which refuses to close all the way. As I spent the evening running logic circles in my head (“That’s so much money” … “You knew it had to be done when you bought”… “It has to be done” … “That’s so much money” … “Bathrooms recoup 102 percent of their investment”… “That’s so much money”…), I realized what I really wanted, more than an upstairs toilet that flushed without leaking and a downstairs bath with a usable shower, was someone to calm me down and tell me it was all going to be o.k. It turns out that adventures lead to scary places when you might least expect them to, and, when carving out a new life, one is likely to hit knots or veins (depending on your material/metaphor of choice) that can force you to work harder to ensure that envisioned design emerges. One hopes the satisfaction of achieving the desired goal is worth all the added sweat and tears, but it wouldn’t be a real adventure if you knew the ending ahead of time. So the Brewster in Bloom parade passed right by my front door this past Sunday, complete with Grateful Dead cover bands on flat-bed trucks, old guys on funny little motorcycles, little kids dressed up as spring flowers and, of course, the Daffodil Queen. Only the most cynically confirmed urbanites could have failed to enjoy themselves during the event. I sat at the street edge of my newly reseeded front yard, chatted with the neighbors across the street during the slow spots and tried to keep Bart the dog from nipping at the heels of horseriders’ mounts. I wish the parades were a monthly event. Then, last night, a small-town tradition unique (I think) to New England, the semi-annual Town Meeting. In the Midwest, we generally elect our representatives, and then let them go about the business of running the government. At election time, we give them our thumbs up or down, based on whether we agree with whatever taxes they might have imposed or rescinded, and whether they got our street onto the annual repaving schedule. Here on the Cape, and in many other towns in the region, the citizens, themselves make those decisions – selectmen can make recommendations and present statements backing their opinions. But, when all the yammering is done, local residents call out their individual “aye” or “nay” on virtually every decision. And if you want your street re-paved, you better be ready to defend your need to all your fellow taxpayers. Oddly, the most contentious issue last night was a vote on a non-binding resolution with absolutely no financial impact. We zoomed through passing a $15 million budget and several hundreds of thousands of dollars in capital expenditures (looks like a couple photocopiers gave out this year). Some $4 million (only about $1.25 million of it out of Brewster coffers, thanks to state matching and other funding) was voted, with only minimal objection, to purchase 50+ acres of new conservation land. All city employees, union and non-union, will be getting 3 percent raises each year for the next 3 years (I wish I had that guarantee). But we hit a major speed bump on a vote to lend town support to an effort to develop a Cape-wide universal health plan. However, the reading of this warrant item prompted several impassioned left-y types to get up and plead the obvious point that insurance is moving out of reach of many in the state (as a self-insured person, I’m paying $1,200 more per year than I did in Illinois for health insurance), and right-y types to get up and argue about the number of Canadians who cross the border for U.S.-style medical access. (Side question: Can we somehow work out a trade of our doctors for their cheap drugs?) In the end, debate was halted, a voice vote was called – and a close majority called out their “aye”s in favor of this non-binding resolution supporting an effort to talk more about a plan to develop a plan. I can’t wait for the meeting when an actual plan for a plan is up for discussion.